A courageous truck strike in Iran, now in its tenth day, is threatening to bring down the Iranian government. The report comes after Russian Foreign Minister Sergei Lavrov announced Monday that the Syrian army should be the only force on the southern border of the country. Iran-backed forces, including Hezbollah, were preparing to withdraw from southern Syria against the backdrop of regional and international negotiations currently under way between the United States, Russia and Jordan over the war-torn country’s future, the Syrian Observatory for Human Rights reported Thursday. Specifically, the London-based organization reported, Iran and Hezbollah were planning to withdraw forces from the Dara and Kuneitra areas near Israel’s northern border. “All the forces that are not Syrian should withdraw, and there must be a situation in which only the forces of the Syrian army will be stationed on the Syrian side of the border with Israel,” Lavrov said. The Syrian commander’s decision indicates the regime’s decision to demand that Iran close shop on the southern border is a first step in a broader policy of booting Iranian forces completely from Syria, according to the source in the Syrian army. Israel says Hamas “begged” for cease-fire to end latest conflagration after Israeli aircraft bombed Gaza with unexpected intensity • Outcome suggests Hamas was dragged into fighting by Islamic Jihad, fearing it would be cast as collaborating with Israel. Hours after the latest Gaza flare-up drew to a close Wednesday, defense officials were upbeat, saying Israel should be satisfied with the results. The officials said that Hamas, which has controlled the Gaza Strip since 2007, was taken off guard by the intense nature of the fighting. Islamic Jihad fired a barrage of some 30 mortars toward Israel on Tuesday morning, which triggered the most aggressive escalation since the 2014 Gaza war. According to defense officials, Hamas signed off on the barrage ahead of time so as to let the Islamic Jihad exact revenge for an incident earlier in the week, in which Israel killed three of its members when they tried to plant an explosive device near the Gaza border fence. However, despite the initial green light, Hamas was taken aback by the large number of mortar bombs fired toward Israel and was also surprised by the Israeli retaliation, which included some 30 daytime sorties targeting Hamas and Islamic Jihad targets. Officials believe that Islamic Jihad dragged Hamas into a military confrontation it did not actually want. As a result, Hamas fired rockets toward the Israeli communities near the Gaza Strip – a step it has not taken since the conclusion of the 2014 war, not even in cases where Israel successfully destroyed cross-border Hamas tunnels (10 in total) or when more than 100 Palestinians storming the Gaza fence were killed over the course of several weeks in weekly border protests. This unusual decision to fire at Israel may have been taken in order to shed the notion that Hamas is collaborating with Israel. Hamas initially asked for a cease-fire at 9 p.m. on Tuesday and a request was made through Egyptian intelligence officials. It also leaked the request to Arab media. Hamas went on to declare a cease-fire, but toward midnight Tuesday, an Israeli official said no such agreement had been reached. This was followed by an Israeli Air Force attack on the Gaza Strip overnight . The targets included storage facilities for SA-7 anti-aircraft shoulder missiles, a facility for suicide drones, and a site used by Hamas naval forces that held sophisticated amphibious devices. At 1:30 a.m. on Wednesday, Hamas and Islamic Jihad decided to unilaterally stop firing toward Israel. To enforce this decision, Hamas deployed its people in various launching positions to prevent further attacks. For the next few hours this effort was largely successful, but at 5:20 a.m., the rogue factions known as the Popular Resistance Committees and Global Jihad fired the last salvo. Israeli officials believe that Hamas initially felt less deterred when it came to firing rockets and mortars, but ultimately realized that it had made a mistake and begged for a cease-fire. After IDF strikes dozens of terrorist targets in Gaza, Prime Minister Netanyahu says that when Hamas, Islamic Jihad test us, they pay immediately, and if they continue to test us, they will pay far more • Justice Minister Ayelet Shaked: All options are on the table. Prime Minister Benjamin Netanyahu warned on Wednesday of a stronger military response to any resumption of rocket attacks, after Hamas said it would cease fire if Israel did the same. Netanyahu also voiced his support for IDF fighters and security forces and praised the resilience of residents of Israel’s south. The Israel-Gaza border fell quiet under the de facto cease-fire after the most intense flare-up of hostilities between Palestinian terrorists and Israel since a 2014 war. Hamas and Islamic Jihad terrorists fired dozens of rockets and mortar bombs at southern Israel throughout Tuesday and overnight. Israel responded with tank and airstrikes on more than 50 targets in the coastal enclave. There were no reports of further attacks after Hamas announced the cease-fire on Wednesday. Israel signaled it would halt its strikes if the rocket barrages stopped. Israel stopped short of declaring any formal cease-fire with Hamas and Islamic Jihad but said any resumption of attacks would bring a stronger military response. Diplomatic-Security Cabinet members convened on Wednesday to receive an update on the IAF strikes and learn of the extensive damage to a number of strategic Hamas sites. As part of Israel’s public diplomacy efforts, Deputy Foreign Minister Tzipi Hotovely met with British Minister of State for the Middle East Alistair Burt to discuss the rocket barrage on Israel, necessary changes to the Iran nuclear deal following the U.S. withdrawal from the accord and bilateral economic ties between the two countries following the Britain’s exit from the European Union. Hotovely thanked Burt for his commitment to Israel’s security and condemnation of the rocket attacks. She called on the international community to join Burt in his condemnation of Hamas’ attack on kindergartens and innocent civilians. Hotovely said the Hamas regime was not interested in rebuilding Gaza or improving the lives of residents there. “It uses the funds invested in the strip to build a system of terror tunnels aimed at harming Israel. We do not want to see what is happening in Gaza happen in Judea and Samaria,” she said. How did the Mossad get the nuclear papers out of Iran? I was reading the article below about a visit to Israel by a delegation from Azerbaijan. I noticed the bit I have marked in bold: a theory that is circulating (and it seems a very reasonable one) on how the Mossad got the stash of nuclear papers out of Iran. Theory is that it was transported (by truck?) to Azerbaijan then flown back to Israel. Even more curious is that this theory (published by a paper in Kuwait) was quoted from an Israeli source. Hmmmmm….. Anyway, I have a friend at work who is from Azerbaijan, and muslim of course. He is heavily into watching UFC fights like me, and we often catch up to watch UFC events together. He, and his mates from Azerbaijan, are all very proud of their country’s views on Israel, and they are very supportive of Israel as well – I get along with them just fine with my pro-Israel views. I guess they like the top quality defence equipment that Israel sells them, ha ha. But how they reconcile their views on Israel with the teachings of their religion is beyond me. I guess I will never understand. On May 14, as the United States was inaugurating its new embassy in Jerusalem, senior officials from Azerbaijan visited Israel for a first-ever meeting meant to strengthen economic ties between Israel the two countries. An Azeri delegation headed by the Azeri tax minister stayed for three days, meeting with Minister of Jerusalem Affairs and Minister of Environmental Protection Zeev Elkin on ways to promote economic, commercial and business ties. Israeli Prime Minister Benjamin Netanyahu visited the country in December 2016 to strengthen relations between the countries. Azerbaijan is a major customer for Israeli weapons, having purchased nearly $5 billion in arms from the Jewish state, including radar systems and drones, which it uses in a protracted war with Armenia over control of territory. Reports also suggest that Israel uses Azer territory to surveil neighboring Iran. The Kuwaiti paper Al-Jarida quoted an Israeli source as saying that the massive cache of Iranian documents Netanyahu recently displayed in a televised presentation on the nuclear threat of Iran were smuggled by Mossad agents to Israel through Azerbaijan. Azerbaijan provides Israel with energy, and receives high-tech, medical and agricultural supplies from Israel. Though the country is 97 percent Muslim, it is home to approximately 12,000 Jews and to several Jewish schools, a Chabad center and a kosher restaurant in Baku, the nation’s capital and commercial hub. The Israeli military on Wednesday night released details on six of the more than 65 sites it bombed Tuesday in the Gaza Strip in response to rocket and mortar fire, saying one target was a collection of unmanned submarines that Hamas planned to use for sea-based terror attacks. The Gaza-ruling terror group has been suspected of possessing remote-controlled submarines for over a year, though the Israel Defense Forces had not publicly acknowledged this capability until Wednesday. These underwater drones could be used to attack any number of Israeli targets at sea, including natural gas drilling platforms, civilian ships and navy vessels. Tuesday, Hamas, the Palestinian Islamic Jihad and other assorted terror groups in the Gaza Strip fired scores of mortar shells and rockets at southern Israel over the course of 22 hours. The army said over 100 of the projectiles fired were on a trajectory to hit Israel, while many more were apparently launched but failed to clear the border. Most of the incoming projectiles that were heading toward populated areas were intercepted by the Iron Dome missile defense system, though several exploded inside Israeli towns and communities, causing damage to buildings and injuring four people, three of them soldiers. In response, the army conducted two rounds of air raids in the Gaza Strip, striking more than 65 targets, including a Hamas attack tunnel, the military said. The Israel Defense Forces listed a variety of targets hit in the raids — weapons depots, command and control centers, naval bases — but initially refrained from detailing what was struck. On Wednesday night, the army released a video (above) more specifically identifying six of the targets. These were: two Hamas drone facilities, one for storing drones outfitted with explosives and another a test site; a cache of shoulder-fired SA-7 missiles; a rocket manufacturing plant; a Palestinian Islamic Jihad depot for storing locally produced rockets; and the Hamas naval armory. The Israeli military has long believed that Hamas was expanding its naval capabilities, both in terms of technology like unmanned submarines and in training frogmen to infiltrate into Israeli territory from the sea and to attack Israeli vessels. “Hamas is making serious developments in the underwater domain,” a naval officer told The Times of Israel last year. Hamas has used unmanned aerial vehicles on a number of occasions, including during the 2014 Gaza war, though they have been of limited utility. The terror group appears to have stepped up its interest in aerial drones as the technology has gotten cheaper and easier to obtain. Drones cannot be legally imported into Gaza, and Israel has thwarted a number of attempts to smuggle them into the coastal enclave through the Kerem Shalom Border Crossing. However, Hamas has adopted a new tactic to get around the Israeli scanners, according to the deputy administrator of Kerem Shalom. The terror group has importers in the West Bank break down the drones into their component parts and then try to transport the smaller, less detectable pieces through the crossing, he said. Last week, Israel discovered an intact explosives-laden drone in Israel after it apparently crashed. The army believes the drone was meant to target Israeli soldiers serving along the Gaza border. It was not immediately clear why the drone had not been used for this purpose. The head of the IDF’s Southern Command said Wednesday that Hamas and other terror groups in the Gaza Strip were “very deeply deterred” by the air force’s bombardments. “We struck many valuable targets, important targets that we’ve waited a long time for an opportunity [to strike them]. I think at this point, there’s a significant achievement for us,” Maj. Gen. Eyal Zamir told officers on Wednesday. “I think Hamas and the other terror groups in the Gaza Strip are very deeply deterred, and there is a lack of will and desire to reach a situation of another full-scale campaign,” Zamir said. Critics of the army’s actions on Tuesday and Wednesday noted that the military did not strike the terror cells firing the rockets and mortar shells at Israel. The Hamas-run Gaza health ministry did not report on any casualties in the IDF’s strikes. Also on Wednesday, Prime Minister Benjamin Netanyahu said the military delivered the “harshest blow” in years to Gaza terrorist groups, which he said were inspired by Iran. “Since yesterday the IDF has strongly retaliated against the firing from the Gaza Strip and has hit dozens of terrorist targets in the harshest blow we have dealt them in years,” Netanyahu said. TOI staff contributed to this report. t least 50 senior Taliban leaders were killed last week in a rocket artillery strike during a meeting in Afghanistan’s Helmand province, a U.S. military official said. “We think the meeting was to plan next steps,” said Lt. Col. Martin O’Donnell, spokesman for the U.S.-led Coalition in Afghanistan, Reuters reported. The meeting took place in Helmand’s district of Musa Qala on May 24 and included a number of senior Taliban commanders from several Afghanistan provinces, the U.S. military said. 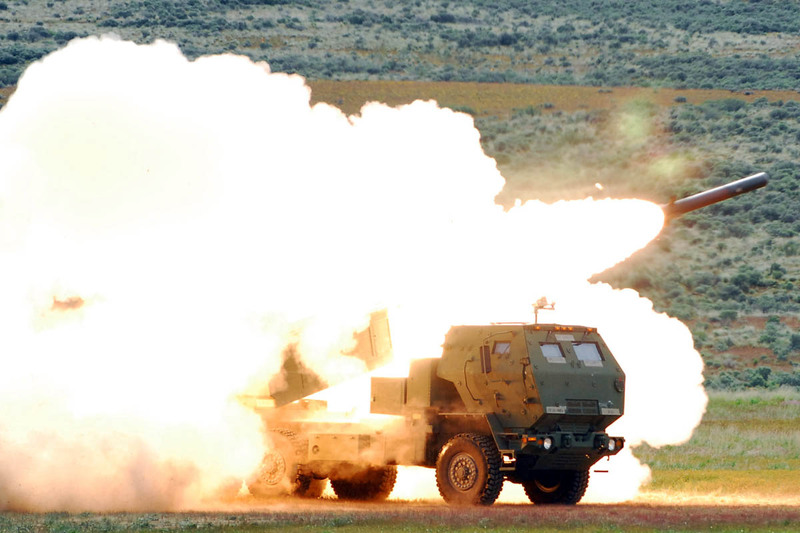 US military: More than 50 Taliban leaders attending a high-level Taliban meeting were killed during a HIMARS strike (four rockets) that destroyed a known Taliban command and control node in Musa Qal' ah, May 24. The strike comes amid the Taliban’s recent launch of its annual spring offensive. “It’s certainly a notable strike,” O’Donnell continued, adding that a number of other Taliban commanders had been killed in U.S. airstrikes in a 10-day period. The Taliban denied the report and said that only five civilians in two civilian houses were killed. “This was a civilian residential area, which had no connection with the Taliban,” Taliban spokesman Qari Yousaf Ahmadi said in a statement. The United States has upped military pressure against the Taliban in recent months in an effort urging Taliban leadership to enter peace talks with the Afghan government. Last week, Army Lt. Gen. Austin “Scott” Miller was nominated by President Trump to succeed Army Gen. John Nicholson as the next commander of U.S. and Coalition forces in Afghanistan. Since 2016, Miller has been serving as the commanding general of the Joint Special Operations Command.